"Eric Hoffer, in his book The True Believer, makes an incredibly profound statement. He declares that a movement can exist without a god, but never without a devil! Hitler understood that when he made the Jews the devil and convinced the German people that the Jews were responsible for all that was wrong in their society, and even convinced them that it was the Jews who were responsible for Germany losing the Great War. Hitler was able to unify the German people in their hatred for the Jews and in their desire society of them. The Jews were the devil to the German people because Hitler made them so." "With the collapse of the Soviet Union and the tearing down of the Berlin Wall, those who wanted to start a movement had to find a new devil, and there were a host of Evangelical preachers who declared that the gays and lesbians of America were the devil. Homosexuals, they contended, were going to destroy the American family and bring an end to the godly values that gave birth to this country. They declared, "We have to get rid of this devil! We have to drive the homosexuals out of our society!" 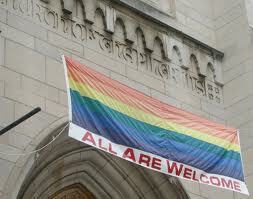 There are those who have dared to say that the gay community is not the problem for the American family. In reality, it is the heterosexual community that is filled with people who are getting divorces. Divorce and marital separation have left half of the children of our country with single parents and, in some cases, with no parents at all. It’s the heterosexuals who are getting divorces. The gays want to get married—and if you can’t see the irony of that, you have no sense of humor whatsoever." Where do we Find Life?